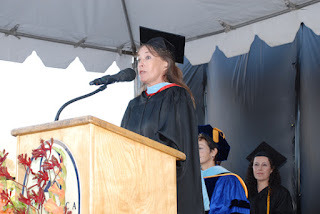 Cuyamaca College: "This place feels like home"
As commencement season wraps up, we wanted to share an excerpt from Cuyamaca College speech instructor Nancy Jennings' graduation address, given just a few weeks after she was injured in a serious bicycle crash. When I set foot at Cuyamaca College in 1989, my first thought was, “This place feels like home.” It is 23 years later and I still feel the same way. As your instructors, we have struggled no matter what was going on around us to do our very best to make Cuyamaca College feel like home to you. Some of you have had to work a part-time, or even a full-time job to make it through. Some of you are parents, or re-entry students or struggle with English as a second language. You didn't just get your degree or certificate without sacrifice and hard work. We can see it on your faces when you come to class, and whether you know it or not, your stories affect us and can stay with us for years. 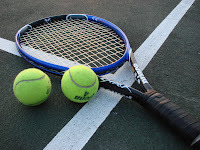 Cuyamaca College's tennis team is sponsoring Kids' Tennis Fest 2012 -- three sessions of youth tennis camps that are being held as a fundraiser for the team. Rackets, T-shirts and snacks will be provided. The first session is for 8- to 13-year-olds and will be held June 25, 27 and 29 from 8:30 a.m. to noon. The second session is for middle- and high-schoolers and will be held July 24, 25 and 26 from 8:30 a.m. to noon. To Complete or Not to Complete...Is This The Question? Community college leaders across the country are talking about ways to help students succeed in their classes and graduate with a certificate or degree. You might have heard about the initiatives called the College Completion Crusade, the American Graduation Initiative, or the Student Success Agenda. · The United States, which used to lead the world in the proportion of young people it graduated from universities, now ranks 14th. · Three-fourths of the 20 fastest-growing careers and 80 percent of “middle class jobs” in the United States require college certificates or degrees. · Studies predict that by 2018, the nation’s postsecondary system will have produced 3 million fewer college graduates than demanded by the labor market. Four business leaders have been chosen as the new officers of the Foundation for Grossmont & Cuyamaca Colleges, and a banker has been added as a new member of the fundraising organization for the two East County colleges. The new officers of the 19-member board are: La Mesa attorney Ron Oberndorfer, chair; Mike Hansen, director of the Grossmont Shopping Center, vice-chair; financial advisor Guy Gonzales, treasurer; and Yehudi “Gaf” Gaffen, chief executive officer of Gafcon, Inc., secretary. They will begin their two-year terms July 1. Rhuan Rogerio, a business relationship manager at Wells Fargo, was elected as a board member at the foundation’s June board meeting. The following message was sent by Chancellor Cindy L. Miles to employees at the Grossmont-Cuyamaca Community College District. Staying healthy sometimes means making some difficult choices. Should I eat that tempting piece of chocolate cake or bite into a healthy apple? Should I stay in bed a few minutes longer or get up and work out at the gym? We all know the right answer to those questions, but it can require a lot of self-discipline to get the results for our bodies that we want to see. At the District, we’ve had to make many difficult choices to maintain our financial health. Last night, our Governing Board approved our 2012-2013 Tentative Budget, as we are required to do under the state Education Code. To deal with the $22.8 million budget shortfall we face this year, we had to make some painfully tough cuts, including the third year of reducing course sections, leaving positions unfilled, reducing operating expenses, and delaying facility maintenance. Drastic mid-year cuts drained the amount of money we could carry over from this year, leaving us without much of a safety net if we are hit with surprise cutbacks again this year. You might say that Jeff Baker, Grossmont College’s new vice president of student services, is following in his father’s footsteps. Baker and his father, John Baker, are believed to be the only father-son combination both serving as vice presidents among California’s 112 community colleges. Baker’s father, John Baker, spent more than 30 years working as an administrator at California community colleges before he retired in 2004. He is currently serving as interim vice president of student services at Citrus College in Glendora, Calif. The younger Baker, who started at Grossmont College in June, had 18 years of experience working at California community colleges before arriving at Grossmont. As vice president of student services, he oversees several departments and programs that provide student services, including financial aid, admissions and records, counseling, athletics, the Career Center, transfer, and veterans. Grossmont Middle College High School, which is held on the Grossmont College campus, recently held graduation ceremonies for its 10th graduating class. The high school is a collaborative effort between the Grossmont Union High School District and the college district. Middle college students concurrently take classes for both high school credit and college credits. By the time they graduate from high school, most Middle College students have earned approximately 30 units of college credit. This year's graduating class of 40 students earned approximately $410,000 in scholarships and grants, and had more than 1,000 hours of college under their belts. Serving as valedictorian for the senior class of 2012 was Gabrielle Alexandria Gomez, with a 4.571 grade point average. The salutatorian was Amanda Baron with a 4.5 GPA. At the ceremony, Cathy Zemlick, Middle College founder and lead instructor, was honored because she is retiring this month. 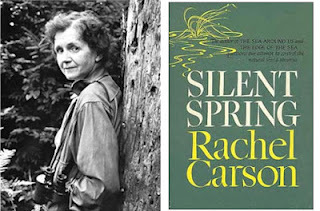 Grossmont College students to study "Silent Spring"
Students in classrooms across the Grossmont College campus will be discussing "Silent Spring," the book credited with helping to launch the environmental movement of the 1960s, during the 2012-2013 academic year. Grossmont College will be participating with five regional universities and several organizations in a collaboration studying similar themes from a single book while enrolled in courses spanning a variety of academic disciplines. This is the second year in a row that Grossmont College students will focus their studies on a single book. During the 2011-2012 academic year, students read "The Immortal Life of Henrietta Lacks," a bestseller raising ethical issues about the use of cells taken from a poor African-American woman who died of cancer in 1951. The cells were used in thousands of studies and played a key role in medical research. 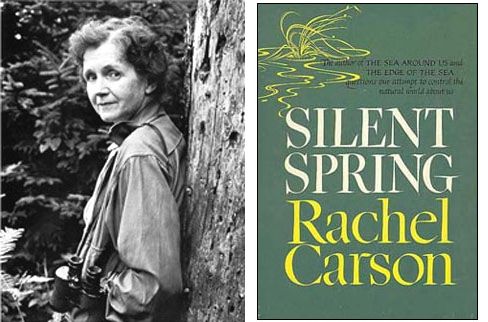 This year's book, "Silent Spring,” was published in 1962 and has been often cited as one of the best nonfiction books of the 20th century. The book by biologist Rachel Carlson documents the detrimental effects of pesticides on the environment. The book was critical of U.S. chemical manufacturers and public officials who reportedly accepted industry claims while ignoring warnings. Historians today credit the book with facilitating the government’s 1972 ban of the pesticide DDT. Two new student trustees will be taking their seats on the Grossmont-Cuyamaca Community College District Governing Board this month. The student trustees, who are elected by their peers as non-voting Governing Board members, are Grossmont College student Samantha Elliot and Cuyamaca College student Mohammed “Mo” Alyasini. Elliot and Alyasini’s presence on the board comes at a pivotal time for the district, poised for a November general election that will determine whether additional debilitating state budget cuts are in store. Community colleges statewide are calling for public support of Gov. Jerry Brown’s proposal for temporary tax increases, saying its loss in the November election would trigger $300 million in cuts to the two-year college system on top of the $502 million loss already taken for the current academic year. Lisa Ledri-Aguilar, an associate professor of English at Grossmont College, has been honored with a statewide award from the California Association for Teachers of English (CATE), a non-profit organization promoting communication, collaboration, and educational knowledge among all responsible for teaching English and the language arts. The award is considered one of the highest awards granted to English professors and teachers in California. Ledri-Aguilar was recommended for the award by peers and students at Grossmont College and was nominated by the Greater San Diego Council of Teachers of English (GSDCTE), a professional group that she currently serves as 2012-2013 president. She received a 2012 CATE Classroom Excellence Award in the College Division for her work in teaching remedial reading and writing courses that helps first-year college students succeed with college-level assignments. The award honors classroom teachers who exemplify the best teaching practices. The tradition is continuing for Grossmont College graduates who are serving as El Cajon police chiefs. 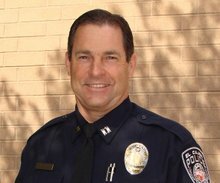 Jim Redman, who graduated from Grossmont College in 1999 with an associate degree with honors in Administration of Justice, recently was named chief of the El Cajon Police Department. He succeeds Pat Sprecco, also a Grossmont College grad. Bill Garrett, president of the Grossmont-Cuyamaca Community College District Governing Board, and Mary Kay Rosinski, board vice president, have been re-elected without opposition for another four-year term. Because they had no challengers, the names of Garrett and Rosinski were not on the June 5 ballot for East County voters. The college district operates Grossmont College in El Cajon and Cuyamaca College in Rancho San Diego, serving almost 30,000 students. Garrett was appointed to a two-year term on the district’s Governing Board in 2004, soon after he retired as El Cajon’s city manager. Garrett had previously served as president of the Cuyamaca College Foundation and as a member of the district’s Citizens Bond Oversight Committee. He was elected to a two-year term in 2006 and a four-year term in 2008. In December, fellow board members unanimously chose Garrett for a fifth one-year term as board president. The San Diego Blood Bank, a non-profit independent blood center serving patients in more than 50 hospitals in the Southern California region, has presented Grossmont College in El Cajon with a “Partners 4 Life” award based on the college’s participation in hosting blood drives held at Grossmont’s Main Quad area in the middle of campus. A nursing grad gets her pin. Grossmont College’s School of Nursing recently held its graduation pinning ceremony for its Class of 2012, which included 35 graduates who earned a two-year associate degree in nursing. The pinning ceremony, held May 29, is a tradition for graduations of new nurses, said Debbie Yaddow, Grossmont’s Associate Dean of Nursing. The School of Nursing’s pin bears the Grossmont College seal as well as the college’s mascot, a Griffin mythological creature that is half-eagle and half-lion. Established in 1967, Grossmont’s School of Nursing has graduated more than 5,000 nurses during its four-decade history. The nursing program is approved by the California Board of Registered Nursing (BRN), and is currently in its fourth year of a five-year accreditation by the National League for Nursing Accrediting Commission (NLNAC). For more information on Grossmont College’s School of Nursing, visit www.grossmont.edu/nursing. Women Give San Diego, a local nonprofit organization, has awarded Grossmont College’s Office Professional Training (OPT) program a $15,500 grant to assist with counseling services for OPT students. The commencements held at Cuyamaca and Grossmont colleges this week, in which more than 2,300 students received degrees or certificates, were a joyous and welcome change to the budgetary gloom that has settled over the state’s community colleges. Cuyamaca College honored 695 students who received degrees or certificates Wednesday at the 34th annual commencement held at the student center quad. On Thursday, Grossmont College lauded 1,664 students receiving their degrees and certificates at the college’s 51st commencement at the main quad. Both colleges in the Grossmont-Cuyamaca Community College District have had to deal with four years of state budget reductions that have led to funding losses in the millions of dollars and cutbacks for hundreds of classes. For those two evenings, the campuses erupted with the sounds of elation as families and friends applauded and shouted with fervor for the graduates of the class of 2012.